Stamp Happy: National Stamping Month Blog Hop - It's Time to Celebrate! 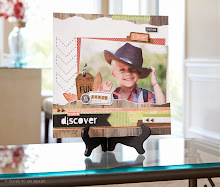 National Stamping Month Blog Hop - It's Time to Celebrate! Hi, all. I love a celebration - especially if it involves discounted stuff!! If you've arrived here from Judy Faye's blog, welcome! I love this set, and I think it coordinates nicely with the May National Scrapbooking Month paper pack, Dotty for You, so if you still have some left, try pairing the two together! I loved the bicycle right away, so I decided to start with that image. I like the circle sayings, too, so I decided to incorporate that. I cut the butterflies (buttercup and sunset card stock) with the CTMH Art Philosophy cartridge, and embellished them with the Mini Opaque pearls. I also stamped the polkadots on the top butterfly (second generation). For the "roadway" I used the NEW Adhesive-Backed Chalkboard Sheet (Z1789). It's really cool. It's a 12x12 sheet of black plastic-y paper with adhesive on the back. It's kind of rough, like a chalkboard, and made of smooth plastic. If you use regular chalk with it, it will rub off, but if you use the NEW CTMH Chalk Marker (Z1767), it works great. I cut a 1/2" strip, and drew the dottled line for the road. Don't forget to check out my "This Month's Specials" tab for some great deals on this and other products! If you want to shop right now, click here! Now hop on over to Kristine's blog to see what treats she has for you to see! Thanks for looking! this is so cute & the road is so clever. Great use of the the chalk board paper! Love the chalk paper. And I really like how you used the polka dot stamp as a textured paper. NICE! So cute - love the bright colors too. Thanks for sharing! Supposed to be so cute!! Cute card! Cool idea for the roadway! Very nice idea and great use of the new products!